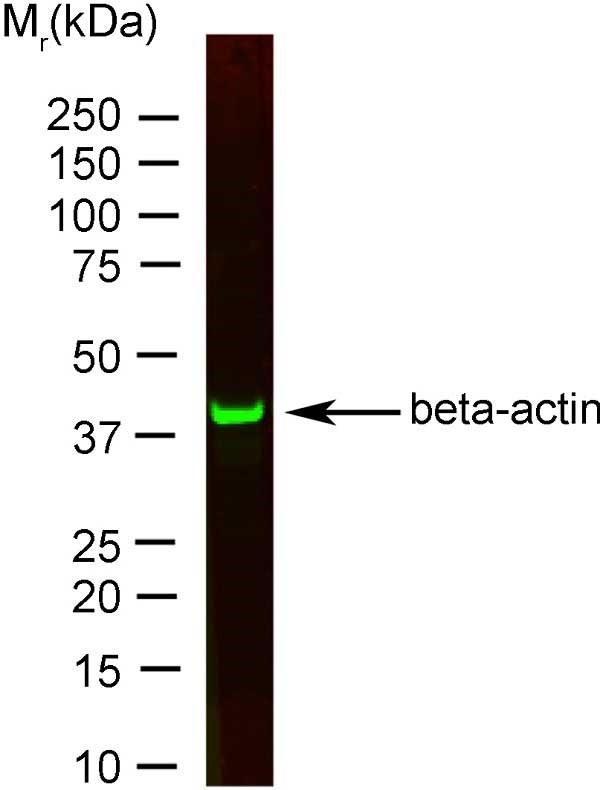 Human anti human actin beta antibody, clone AbD12141 recognizes the 42 kDa product of the ACTB gene, cytoplasmic actin beta, also known as actin cytoplasmic 1. Actin beta is ubiquitously expressed in all eukaryotic cells, playing a critical role in cell survival, motility and re-modelling. A bivalent human recombinant Fab (lambda light chain) selected from the HuCAL® phage display library, expressed in E. coli. This Fab fragment is dimerized via a helix-turn-helix motif. The antibody is tagged with myc-tag (EQKLISEEDL) and a double extended Strep-tag at the C-terminus of the antibody heavy chain. 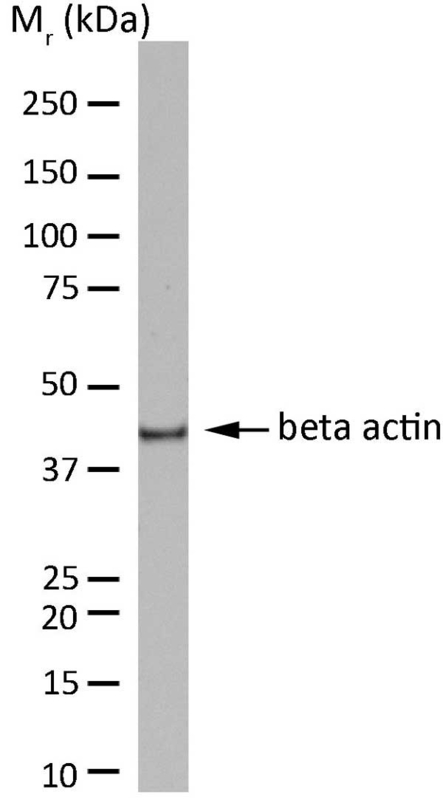 This antibody is supplied conjugated to Horseradish Peroxidase (HRP) - liquid. A bivalent human recombinant Fab (lambda light chain) selected from the HuCAL® phage display library, expressed in E. coli. This Fab fragment is dimerized via a helix-turn-helix motif. The antibody is tagged with myc-tag (EQKLISEEDL) and a double extended Strep-tag at the C-terminus of the antibody heavy chain. This antibody is supplied lyophilized. A bivalent human recombinant Fab (lambda light chain) selected from the HuCAL® phage display library, expressed in E. coli. This Fab fragment is dimerized via a helix-turn-helix motif. The antibody is tagged with myc-tag (EQKLISEEDL) and a double extended Strep-tag at the C-terminus of the antibody heavy chain. 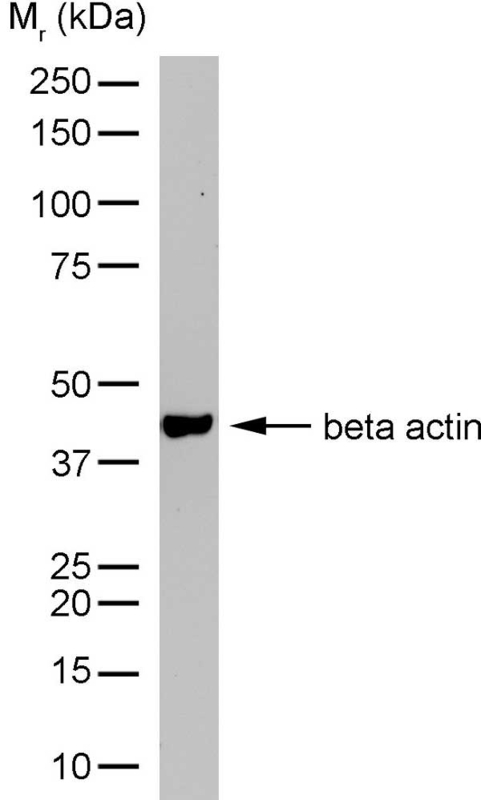 This antibody is supplied conjugated to DyLight 800 - liquid. A bivalent human recombinant Fab (lambda light chain) selected from the HuCAL® phage display library, expressed in E. coli. This Fab fragment is dimerized via a helix-turn-helix motif. The antibody is tagged with myc-tag (EQKLISEEDL) and a double extended Strep-tag at the C-terminus of the antibody heavy chain. This antibody is supplied conjugated to DyLight 680 - liquid. HCA147 detects a band of approximately 42 kDa in HeLa cell lysates. HCA147 is suitable for use as a loading control.